two summers ago, while i was at the ranch, paul bowen's class closed the week-long workshop with a visit to aspen's own goldsworthy installation at the aspen institute and a few galleries in town. we saw a bunch of really magnificent little sculptures by mel kendrick. these are apparently cast from successive layers of white and black tinted concrete, but their form originates in experiments on much smaller pieces of wood. 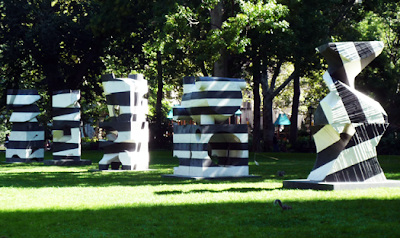 the conceit here is that each sculpture consists of a stack of two separate pieces, one of which is composed of pieces that have been removed from the other. the pieces we saw in aspen had been carefully bandsawed apart and then glued back together; these much larger sculptures have a similar texture. this is not intuitively obvious, which is why it's so cool; the negative/positive volume construction may be easier to see in this much less fancy photo i took of the piece second from the right in the image above.